Earlier this month, the Learning Community celebrated the national Week of the Young Child. On “Friendship Friday,” children at the Hillspoint Road preschool and kindergarten participated in activities with buddy classes. They also helped youngsters at Cesar Batalla School in Bridgeport. Many children there depend on the school as their primary source of food. School breaks — like this one — mark a week of food insecurity. So throughout the Week of the Young Child, Learning Community families donated healthy snacks and drinks. The children made signs, and helped organize the food into categories. At the end, every boy and girl helped fill 131 huge bags with granola bars, applesauce, pretzels, crackers, milk and juice. The bags were delivered to Cesar Batalla before the end of the school day. It was a true group activity. Thanks to the Learning Community kids, for helping their less fortunate peers. Congratulations too to the Learning Community staff and parents — led by kindergarten teacher Valerie Greenberg — for instilling the values of care and compassion, and emphasizing the importance of volunteerism, in Westport’s youngest citizens. We care about our friends and neighbors. 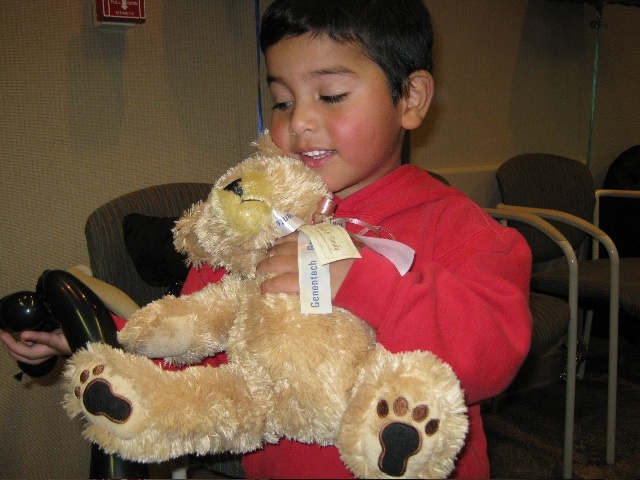 We care about kids and older folks in need, here and in nearby towns and cities. We want to help — particularly in this holiday season. But we don’t always know how. Here are a few great ideas. 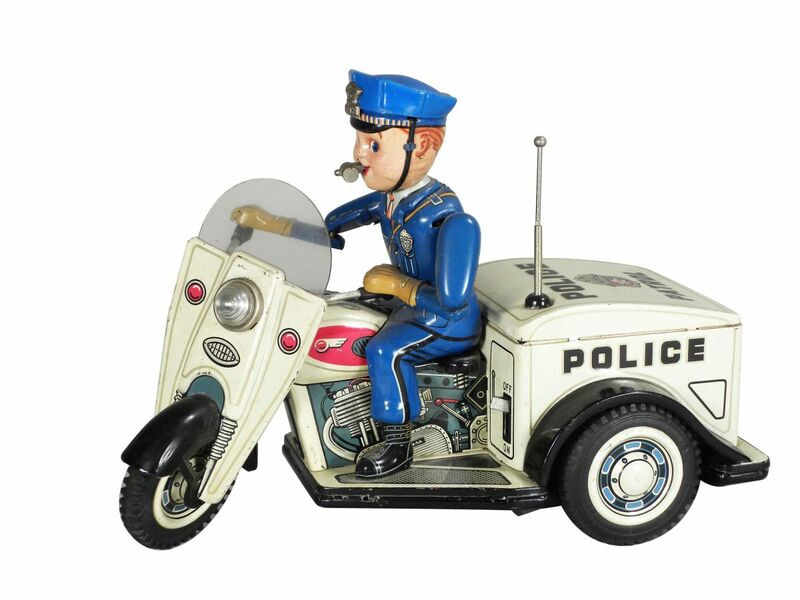 The Westport Police Department Local Union #2080 and Police Benevolent Association host an annual Holiday Toy Drive. Thousands of donations benefit underprivileged children throughout Fairfield County, and beyond. Westport police officers will accept new, unopened and unwrapped toys — and cash donations — in the ASF Sports parking lot (1560 Post Road East) on Saturdays and Sundays, December 8, 9, 15 and 16, between 9 a.m. and 5 p.m. Questions? Email jruggiero@westportct.gov, or call 203-341-6017. Westport’s Department of Human Services annual, confidential Holiday Giving Program helps over 400 residents each year. Donors contribute gift cards to local stores, supermarkets and gas stations. Cash donations are welcome too; Human Services staff uses them to make purchases for clients. Checks (payable to “DHS Family Programs,” with “Holidays” on the memo line) and gift cards may be mailed to or dropped off at: Town Hall, 110 Myrtle Avenue, Room 200, Westport, CT 06880. For more information, email hsyouth@westportct.gov, or call 203-341-1069. Individuals and families needing extra support during the holiday season should call 203-341-1050. A new online option helps Westport’s most vulnerable residents this season — and beyond. Over 400 individuals and families in town meet the federal poverty level. The Barbara Butler Fund connects at-risk youth with enrichment opportunities. The Residents in Need Fund provides emergency financial assistance for food, shelter, utilities, medical expenses and other critical needs to Westport residents meeting income guidelines. The Senior Client Needs Fund serves seniors on limited or fixed incomes during periods of financial hardship. The Family-to-Family Fund supports offers help with unforeseen expenses during times of financial hardship. Toquet Hall, located downtown, offers social, cultural and recreational opportunities to teenagers. Prevention and Educational Programming gives free education and awareness events addressing substance abuse, mental health and parenting education. Donors who want to help but have no preference of which population to assist can direct funds to the Area of Most Need. This assists residents of any age, when most urgently needed. To donate to any of these 7 funds, click here. 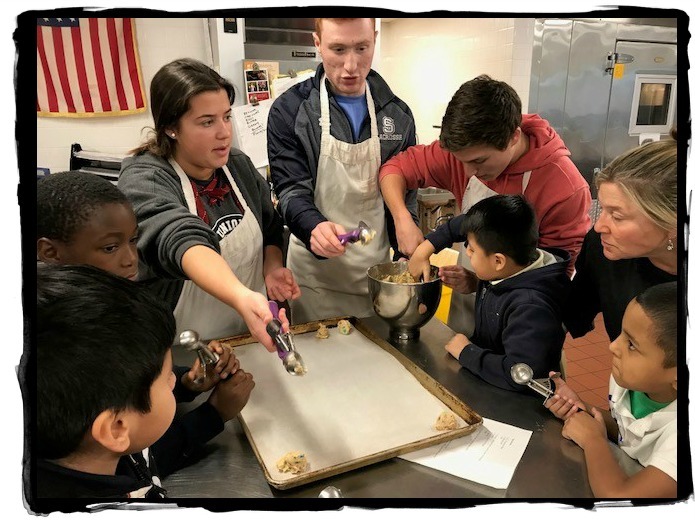 In recent years, Bridgeport’s Cesar Batalla School has become a favorite destination for Westporters hoping to help youngsters enjoy the holidays. 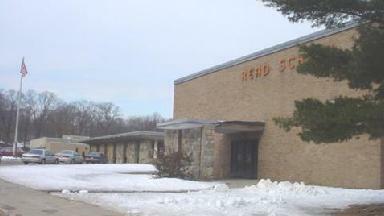 The school serves children in high poverty brackets. Some live in shelters. 100% are fed breakfast and lunch at school. Their families have no money for basic necessities — let alone holiday gifts. Westporters can provide some of those gifts, for children in pre-K through 3rd grade. It’s easy: Click here to order online from Amazon. Orders from the Wish List will be shipped directly to the school. They are also accepting donations at the Family Resource Center in the school (606 Howard Avenue, Bridgeport). Call 203-579-8526 for drop-off times. For more information, email blabrador@bridgeportedu.net. In addition, Lucy’s (23 Jesup Road, next to Green and Tonic ) is taking donations for the Cesar Batalla School. Unwrapped new toys can be dropped off Mondays through Saturdays (10 a.m. to 6 p.m., and Sundays noon to 5pm). If interested, act now! Gifts will be given by Santa on December 20. In 2016, Westporters donated these gifts to the Cesar Batalla School. The other day, alert “06880” reader Melissa Shein nominated several women as Unsung Heroes. 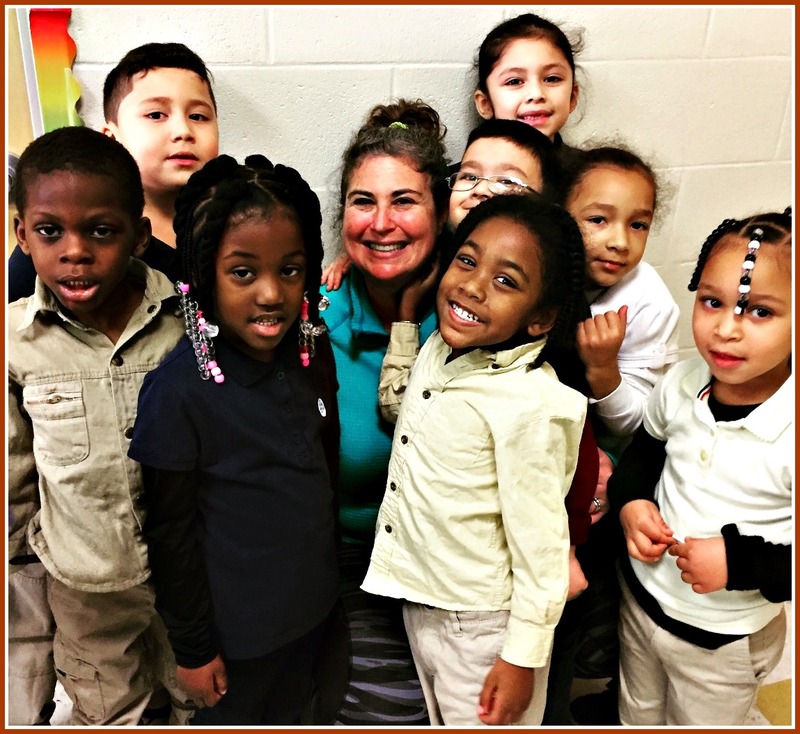 For 4 years they’ve volunteered with her at Bridgeport’s Cesar Batalla School. Together, they’ve helped a 9-year-old learn to read. The boy was born at 24 weeks, weighing just over 1 pound. His twin brother is blind, but learns with ease. This youngster — who loves to play and learn — has shown language and learning difficulties, not easy solved. He’s made good use of the resources provided. But more is needed. Melissa fears he’ll fall through the cracks. He’s already begun to doubt what he can achieve. Westport women have joined to help this Cesar Batalla School student. 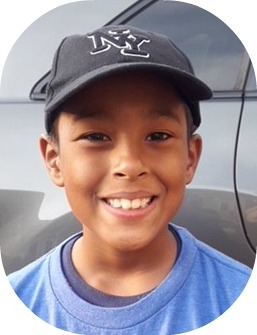 “Given his level of determination, receptivity to instruction and genuine love of learning, it is easy to imagine him developing academic and personal resiliency in a supportive, academically rigorous environment that addresses his specific needs and unique learning style,” she says. So she went to work. Marjorie Almansi provided many contacts of people to do evaluations, to help get him into the Southport School for students with language learning differences. Jill Greenberg did that full evaluation free of charge. She put the boy’s mother in touch with numerous resources. Robin Hellman did a full occupational therapy evaluation, and offered support. The Southport School tentatively agreed to take him. The group — including other volunteers like Gwen Cohen and Sherri Gordon — is working on making that happen now. Melissa and the other women are determined to turn around the life of one young Bridgeport boy. They deserve our Unsung Hero accolades — and awe. Stacey Henske is a dedicated volunteer. She’s involved with many worthy causes — including Westport PTAs. But she and several other Westporters also serve as room moms at Cesar Batalla School in Bridgeport. 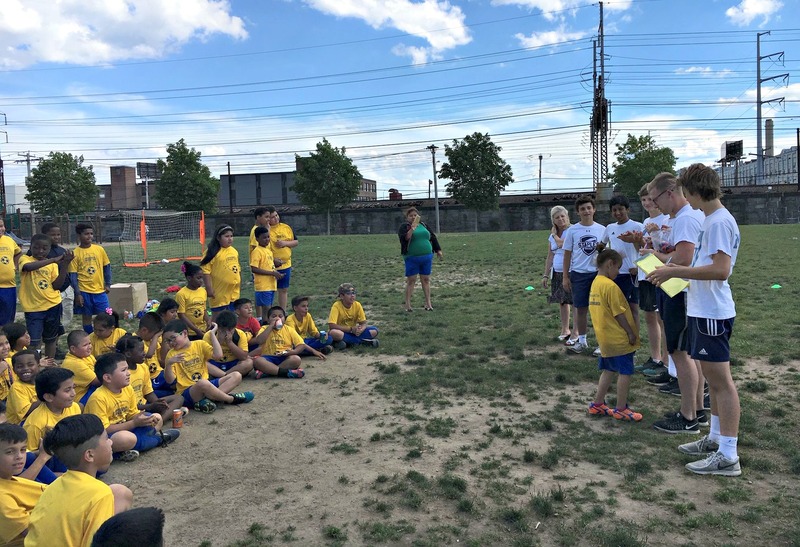 Through the Brighter Lives For Kids Foundation, they help provide opportunities and experiences to city children that will enrich their education. Stacey works with Melody Curran’s 2nd grade class. The other day, she helped organize a visit to Alison Milwe Grace’s Culinary 1 class at Staples High School. 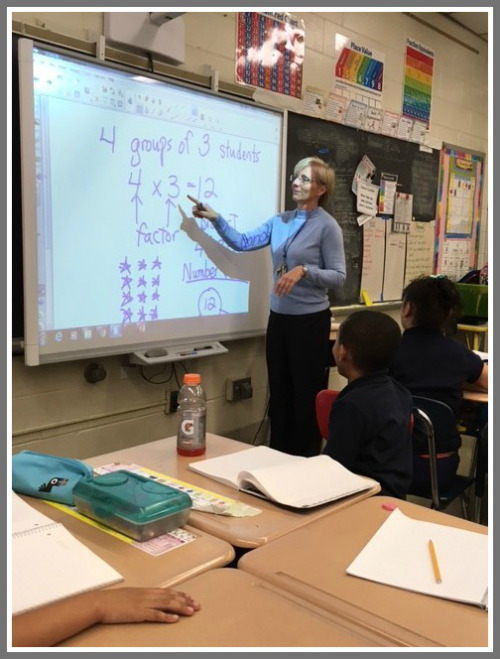 “The Staples students were fantastic with the kids,” Stacey reports. The high schoolers helped the youngsters bake chocolate chip cookies with M&Ms. They learned to measure ingredients, crack eggs and use a mixer. They already knew how to eat cookies, Grace notes. The field trip was a Henske family affair. Learning Through Lighthouse — a Staples club that her freshman son Spencer is involved with — paid for the bus. And her daughter Samantha — a 5th grader at Kings Highway Elementary School — was there too. As the 2nd graders’ adopted “room sister,” she often helps a little girl in a wheelchair. No word yet on what’s next for the Staples/Cesar Batalla menu. Staples and Cesar Batalla students. Chef Alison Milwe Grace is at right. Westporters responded quickly — and generously — to Friday’s post about a toy drive at Bridgeport’s Cesar Batalla School. But there is still an enormous need. The school serves children in the highest poverty brackets. Some live in shelters. Their families have no money for basic necessities — let alone holiday gifts. Westport’s Nicole Straight, surrounded by some of the students she volunteers with at the Cesar Batalla School. Here’s another way to help: Through Christmas, Lisa Savone will personally deliver gifts to the school. Donations can be dropped off at her clothing store, Lucy’s (23 Jesup Road, next to Green & Tonic, across from Westport Library), Monday through Saturday 10 a.m. to 6 p.m., Sunday 12 to 5 p.m. If parking is an issue, just pull into the driveway next to the store. Need alternative arrangements? Email lisa@lucysanswers.com. 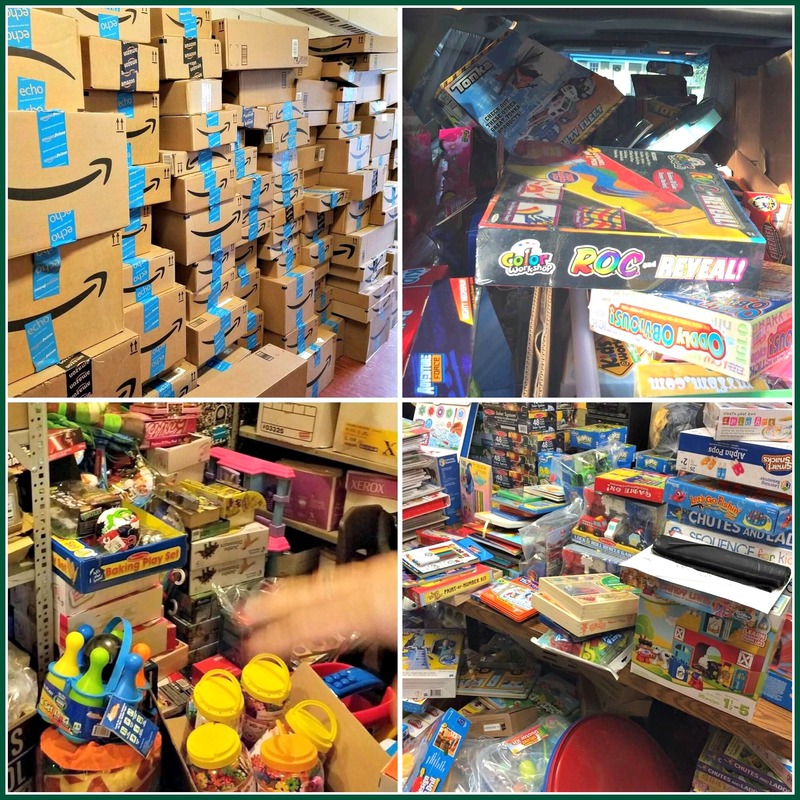 WestportMoms — the great online group — is organizing a real-live toy drive for Cesar Batalla School on Sunday, December 17. From 10 a.m. to 2 p.m., they’ll fil a moving truck in Levitt Pavilion parking lot. There are 20 days left before Christmas. That’s plenty of time to make it a memorable holiday for the wonderful boys and girls at this great — but needy — school. Last year, “06880” posted an urgent plea for help. The Cesar Batalla School in Bridgeport was running a toy drive for their elementary school students. But they were falling far short. Their kids were in desperate situations: the highest poverty brackets, shelters, you name it. 100% are fed breakfast and lunch at school. Their families have no money for basic necessities — let alone holiday gifts. Westporters came through — big time. This year, alert — and generous — “06880” reader Alexis Donnerstag remembered the drive. She asked how she could contribute again. I hadn’t heard anything from the school. But I sent her a link to their website. Within a couple of hours, Benji Labrador called. He’s the school security officer. He said the woman who handled the drive last year is gone. He’s in charge, but did not know about the “06880” connection. Now he does. And so do you. Anyone can order gifts online — at Amazon, for example — and have them shipped to Benji at the school: 606 Howard Avenue, Bridgeport, CT 06606. Click here for a direct link to Amazon’s Cesar Batalla page. You can drop gifts off at Vincent Palumbo Salon (616 Post Road East) — or directly at the school too. For more information, email blabrador@bridgeportedu.net, or homerun5@optimum.net. Meanwhile, closer to home, there’s a tree lighting — plus hot chocolate, s’mores and sliders — at the Riverside Avenue plaza (between Saugatuck Sweets and The Whelk) this Sunday (December 3, 4:30 to 7 p.m.) Santa arrives at 5:15 p.m. The Gault family invites everyone to come. But they hope you’ll bring an unwrapped toy for a child age 10 or under. All gifts will be donated to Al’s Angels. Who are they? Well — in addition to providing holiday joy for countless kids in the area — they’re the volunteers who light the William Cribari Bridge, just a couple of yards away from the plaza. A little gift goes a long way. If you’re like me, you spend time sitting in Riverside Avenue traffic wondering what goes on behind those mysterious windows above Arezzo restaurant. Turns out it’s a design studio, home to the Bonnie Marcus Collection. Launched by Diane von Furstenberg’s former right-hand woman, it’s where 10 very talented people — all local moms — create illustrations for bridal shower, wedding and party invitations; greeting cards; calendars and more. Bonnie has developed licensing deals with some of the biggest companies in the world. Her designs are found in more than 50,000 retail and online stores. But today her studio concentrates on one school, in nearby Bridgeport. Bonnie’s cards often feature hand-painted sparkles. 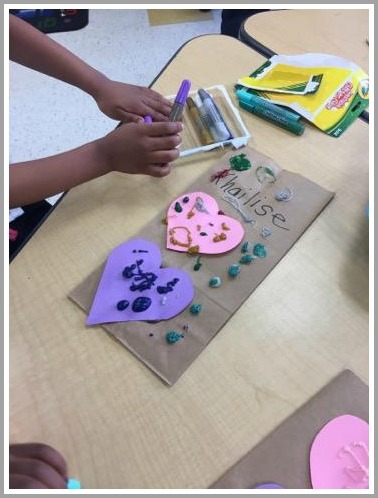 So Westporter Nicole Straight — who volunteers at the Cesar Batalla School, and is a big fan of Bonnie Marcus Collections — came up with an idea: Give every student there a chance to make a sparkling Valentine’s Day card for someone special. 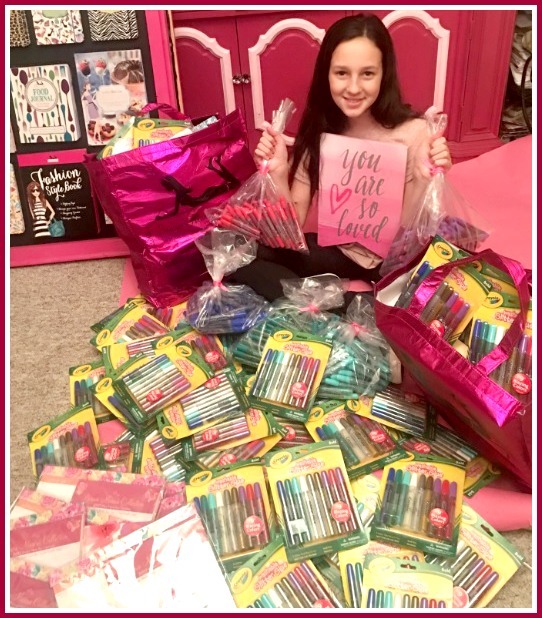 Westport middle school student Sydney Gusick helped package goodies at the Bonnie Marcus design studio. It could be a parent, sibling, teacher or friend. The key is for kids to have fun making their own cards. Today, Nicole is delivered 1,200 sparkle pens to the school. Plus Valentine’s gifts for each teacher: A calendar, filled with color and creativity, for every classroom. Bonnie and the rest of her team enjoyed plenty of smiling faces at Cesar Batalla today. Who knows? They may find a future designer there too. Making a valentine, today at Cesar Batalla School. It started with a small request. Kathy Mahieu — a Westporter who teaches in a Bridgeport elementary school — asked if I could write about the differences between our school district and theirs. I had a better idea: I’d post her 1st-person account. Her words would be far more meaningful than mine. “A Tale of 2 School Districts” provoked a powerful response. Dozens of commenters offered thoughts. Many wondered what they could do to help. The answer: Plenty. And here’s where this story really gets good. Catherine Walsh called Kathy, and provided cartons of paper for the Read School. That simple gesture solved an enormous need. Simultaneously, Jimeale Hede and Carolyn Russo got involved. Using Facebook, they installed “room moms” in every pre-K through 3rd grade classroom. 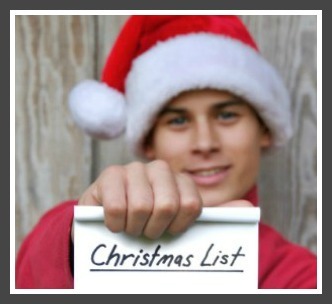 The women published wish lists on their grassroots Brighter Lives for Kids Foundation website. Classroom supplies poured in. Kathy Mathieu in her Bridgeport classroom. Very few teachers have whiteboards. In just one week this month, over $71,000 was raised. Much of that came from a Cushman & Wakefield fundraiser. The money will pay for the purchase of 90 Chromebooks with educational programs, as well as field trips and a soccer program. “06880” readers — and others in an ever-widening circle — volunteered to address other needs. Teachers are identifying students who need shoes or a backpack, for example, as well as requesting items like rugs, headphones and books for their classrooms. Help is on the way Cesar Batalla Elementary School too. Watching the generosity unfold brought Catherine to tears. Westport and surrounding communities rallied around the needy school. Importantly, she says, they’ve “committed themselves long-term” to aiding these children and their families. One of the Westporters who helped with Pamela Long. She heard about a toy drive for the Cesar Batalla and Read Schools. She bought some, but was chagrined to learn that donations were slow. She asked “06880” for help. Again, I was happy to help. Again too, I asked for the story in her own words. Pamela was eloquent. “These kids are in desperate situations — the highest poverty brackets, shelters, you name it. 100% of these children are fed breakfast and lunch at school,” she wrote. “Their families have no money for basic necessities — let alone holiday gifts. Westporters — and readers far and wide — responded instantly. Taking advantage of an Amazon link — and thanks to a generation donation from locally based/internationally known toymakers Melissa & Doug — they blew past the goal. Plenty of people also helped with the logistics: wrapping, transporting, and making the toy magic happen. Some of the holiday gifts that poured in to the Read and Cesar Batalla Elementary Schools. So — when it’s almost time for boys and girls all over America to enjoy the wonder of Santa Claus — let’s pause to thank the men and women (and kids) of our “06880” community (real and virtual) who helped bring smiles to kids a few miles away. And let’s vow to keep helping the boys and girls of Bridgeport every day in the coming year. Maybe it’s the holidays. But I feel like I’ve had more and more conversations lately about raising generous, compassionate kids. This is something I worry about in an affluent community with valet parking on Main Street, designer Christmas trees and shopping lists that include a trip to Tiffany are commonplace. Westport has tremendous charm. But it’s not how the rest of the world lives — though it’s likely the only world our children know. I grew up in a very different place: a small town supported by a lumber mill. I made weekly trips to the secondhand grocery store to search through dented, unlabeled cans (Mom always found the peaches). We didn’t have much, but we always had enough to help a family (or 2 or 3) less fortunate than our. “Adopting” families for the holidays became a tradition, one I looked forward to each year. As I raise my own daughter, it’s a tradition I’ve continued. It’s still my favorite part of the season. 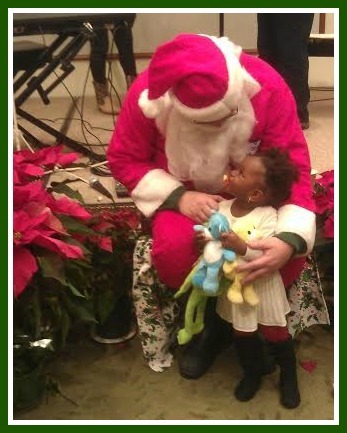 You can be a Santa for kids who need you, just a few miles from here. So when I heard about a toy drive for the Cesar Batalla and Read Schools in Bridgeport, I quickly purchased more than I’m likely to admit to my husband. I assumed there would be an outpouring of support from many others. Sadly, they’re falling very short on donations. The original goal was 1,000 toys for 1,000 kids. Now they just hope for 350. These kids are in desperate situations — the highest poverty brackets, shelters, you name it. 100% of these children are fed breakfast and lunch at school. Their families have no money for basic necessities — let alone holiday gifts. 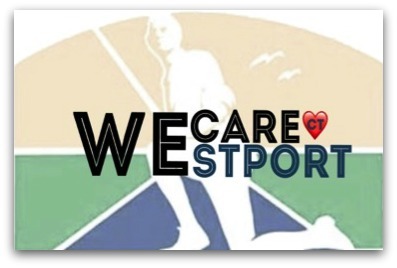 Westport: We can do better. Every child deserves the joy of opening a gift this season. We’ve got 4 more days to come together as a community and show our compassion, by helping those who do not have our good fortune. Open your hearts and your wallets — and get shopping! Your kids can add others to their shopping list. All toys (unwrapped, for 4-9-year-olds) must be dropped off by December 18, so time is of the essence. You can use this as an opportunity to get your own kids involved. Have them help decide the gifts they want to give. They know best what kinds of toys will elicit squeals of joy. It’s a great way for them to practice kindness in a way that’s both meaningful and tangible. You can’t take it with you, folks. Give generously this season. I guarantee you will be the one receiving the gift!